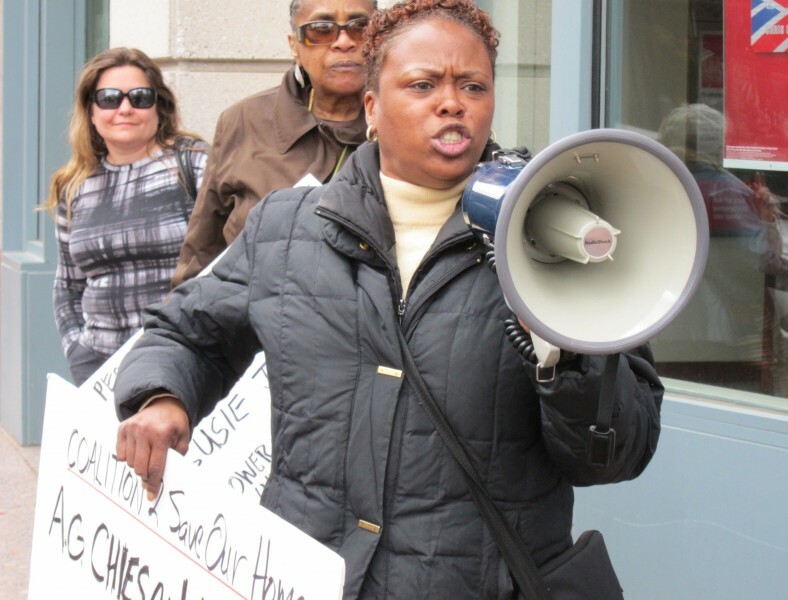 People tell NJ Attorney General: Prosecute predatory lenders | Fight Back! Trenton, NJ - In March, the Coalition to Save Our Homes asked New Jersey Attorney General Jeffrey Chiesa for a meeting. Many of our members have been harmed by predatory lending. We want Chiesa to hear their complaints. His office can do many things to help them. He said no. On April 11 we went to Trenton to protest his refusal and demand that our requests be met. We hear of “liberty and justice for all.” It would be good to have it. But there is no equal protection of the laws when predatory lenders get bailouts and the people they harmed can’t even get a hearing. We won’t accept that. We started the protest with a rally in front of the New Jersey Statehouse, where the governor’s office is located. There were 45 participants. It was a big crowd because it did big things. We gave center stage to the voices of people who have been harmed by predatory lending. They spoke for all of the millions of borrowers who were swindled. They paid far more than their houses were worth. Some have been foreclosed. Some have lost their jobs. Payment records have been lost, ownership records have been lost. Many mortgages are underwater. Many have lost jobs and income because the banks drove the economy into depression. Home prices have reached a nationwide average of more than twice true market value. It was price fixing. Lenders lied to prospective borrowers about things in the fine print. They roped buyers into mortgages they knew would fail. They selectively abused African-American and Latino home buyers with higher fees than those paid by economically comparable white buyers, and extended them more subprime loans. All of these things are illegal. Nothing effective has been done for the millions and millions of people who were harmed. We want the attorney general to do something about it. We want predatory lenders to be prosecuted for price fixing. They must be compelled to lower mortgage principals to reflect the true market value of the properties. There are many other things for which they could be prosecuted. People came from all over New Jersey. They represented many organizations. Other concerns of people’s economic justice were addressed. One speaker talked about the impact of cuts in public services on low-income women and children. Another spoke about Irvington, which lost its hospital a couple of years ago and is now planned to get a medical waste disposal plant that the community does not want. The attorney general’s office had been notified in writing that we were coming to give him a letter. The statement was read aloud to the assembly at the Justice Complex. At no time was there any obstruction of normal activity. We were met by an officer of the State Police. He was courteous but he told us we could not enter the building, which is public. He said he would take our letter to the attorney general and deliver it, but we had to disperse. He said we could not be present as a group because we did not have a permit to be there! We said we wanted to enter the building and turn our letter in to the reception desk of the attorney general’s office. A delegation of three went in. A second State Police officer told us at the sign-in desk that we would not be allowed to go to the office. Our attorney was with us. He told the officer that he had many times been to the attorney general’s office to do the same thing. All we wanted to do was deliver a letter to reception. The officer said we could not go to the office. We had to turn in our documents through him. We gave him the letter and a petition with well over a thousand signatures, but said it was a violation of free speech. We went back outside. The day’s protest was over. The Solidarity Singers fell in, and started singing. People were singing along, hanging out, waiting for the bus. We had accomplished great things. Everybody was happy. We collected the signs. The problem was clear: the powerful officials who hold so much responsibility are afraid of us because we want to be protected by law from the banks. The bus arrived after a few minutes and we went home. It had been a good day’s work. We want the attorney general to prosecute predatory lenders. We want equal protection of the laws. We want reinstatement of the First Amendment and the Bill of Rights. We will keep it up.